Let me ask you a question. How would your life be different if you could end driving anxiety? Spend more time doing fun things with your children instead of being stuck at home? Advance more quickly in your career? Look for work without having to worry about paralyzing anxiety? Get rid of the strain that fear of driving is putting on your marriage? Spend time with friends without having to ask for a ride? Pursue hobbies and interests you’ve quit because driving anxiety has taken over your life? Stop lying and making excuses for why you can’t do certain things? Quit feeling ashamed and different? 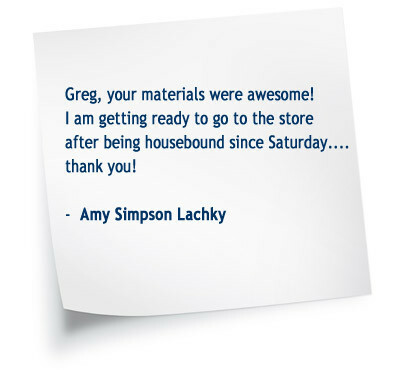 Travel or take vacations without nagging worry? Not plan and live your life around your fears? Regain a sense of control in your life? Feel proud of yourself again? Reduce the toll driving anxiety is taking on your health? 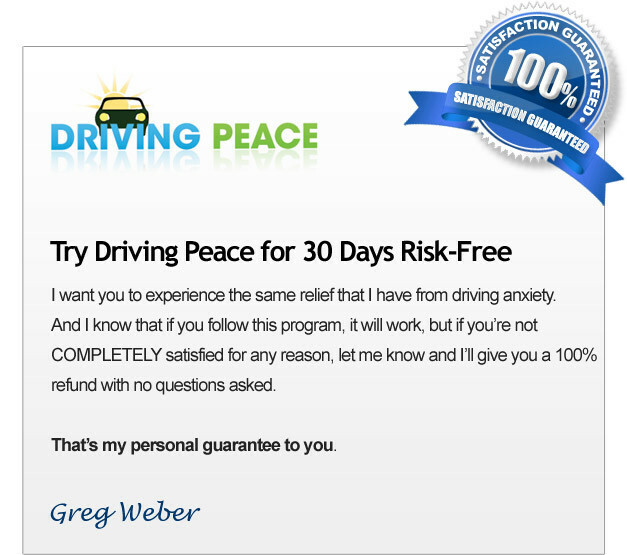 Hi, my name is Greg Weber and I’m the creator of Driving Peace. Driving Peace is an easy-to-use program of very simple techniques to end driving anxiety, also known as driving phobia and fear of driving. The effects of driving anxiety range from being merely annoying for some people to all-consuming and life crippling for others. Fortunately, it’s HIGHLY treatable and can be treated very successfully without dangerous medication. What Causes Driving Anxiety Anyway? Many people feel weak or stupid because they’re afraid to drive. This is simply not true. The fear and anxiety you experience when you drive is NOT YOUR FAULT! I’ll say that again: your driving anxiety is not your fault. You feel uncomfortable and anxious when you drive because your brain has tricked you into feeling anxious. Research has shown that most people who are prone to anxiety disorders like driving phobia are actually highly intelligent. This means that you probably already know your fears about driving aren’t rational and that you’re not actually in real danger when you drive a car. But, you continue to react to driving as if it’s a mortal threat to your safety, even though you know there is no threat. This is why many people feel ashamed when they continue to suffer from fear that they ALREADY KNOW isn’t real. I used to feel this way, too. I thought that rationally knowing my fear of driving wasn’t based on reality should be enough to make me stop being afraid. And I felt ashamed because no amount of telling myself there was nothing to actually be afraid of made the slightest bit of difference. I STILL felt anxious every time I drove a car. Then I found out how my brain was fooling me into being anxious. 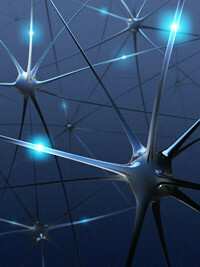 Your brain’s tricky neural pathways. Science has shown that repeated experiences of powerful emotions (like fear) create pathways in the neurons of our brains. Think of these pathways like the grooves in an old-style vinyl record. Then imagine that driving is the record player’s needle that drops into those grooves. Remember in the old days when you had to replace LP records because they eventually wore out? They wore out because every time you played the record, the needle cut the grooves a little bit deeper. And that’s EXACTLY what’s happened with your driving anxiety. At some point in the past, your brain formed a neural pathway that said, “Driving is dangerous! Driving is scary. I must be watchful, I must be on guard. I might get hurt. I’m in danger!” Maybe you had a bad experience with driving at some point where you became anxious or fearful. Maybe you even had a panic attack while driving for no apparent reason. This happens to a lot of people. Whatever the reason, your brain formed pathways about driving that trigger fear and anxiety. Just like the needle on a record player, your brain cut a “groove” of fear associated with driving into its neurons. Old vinyl records would sometimes “skip” when they became scratched. They’d play a short section over and over again until someone lifted the needle OUT of that scratched groove. You’re a victim of your own brain’s neurons. This brain “feedback loop” is known as a “conditioned response,” and it’s the reason your driving anxiety is not your fault. You didn’t wake up one day and “decide” to become fearful of driving a car. Your brain has tricked you! Fortunately, we’re far superior to an old, scratched record. The grooves in a vinyl LP can’t be re-cut. But we can form new “brain grooves” that associate driving with feelings of calm, peace, and control. Doesn’t it make sense that the key to end driving anxiety is to make new “pathways” in your brain that let you respond differently? Pathways that see driving as safe, easy, and peaceful? Since your anxiety is caused by your brain incorrectly associating driving with danger, isn’t it logical that successful treatment would have to include training your brain to form new connections? Traditional talk therapy often fails with driving anxiety because it basically involves paying a therapist to tell you that having an irrational fear of driving isn’t logical and that there’s no good reason to feel anxious. Like you didn’t already know that! These therapists are generally well-intentioned people, but their treatments fail because they’re attempting to use logic to solve an emotional problem, and it just doesn’t work. All the logical explanations in the world won’t stop your anxiety. You already know your anxiety isn’t logical. What you need is to form new pathways in your brain that see driving differently. 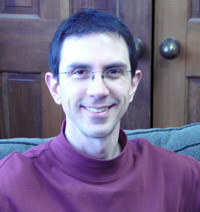 Greg Weber is the creator of Driving Peace. My life used to be ruled by driving anxiety. I used to have to FORCE myself to drive, usually with clenched teeth, a throbbing headache, a pounding heart, unsteady hands, and a churning stomach. Simple things that others appeared to do effortlessly were a constant battle for me. A quick trip to the store or driving my children to school were daily struggles. I’d watch mystified as other people performed these everyday driving tasks confidently, without a care in the world. How did they do it? Why was it so easy for them but so hard for me? How come I couldn’t just “snap out of it” and be normal like everyone else? What was WRONG with me? I wish I had made an “amazing discovery,” or found a “simple trick” that cured my fear of driving. I wish I had enough determination to end driving anxiety by learning everything there is to know about it. But the truth is, I’m just not that smart. I’m a regular person with an ordinary life. I took a meditation class at a local community center. It was one night a week for an hour. I almost chickened out, too, because the community center was on the other side of town and I had to drive to get there. Ironic, isn’t it? The class focused on two main concepts: overall relaxation and mindfulness. Mindfulness is simply learning how to focus on the present moment. After attending the class for a month, I suddenly realized I wasn’t as anxious when I drove. Yes, I still felt fear, but significantly less fear than I’d felt only a month before. I was stunned when I realized what had happened: I was learning how to end driving anxiety without even realizing I was doing it. Like I said, I got lucky. Then I WAS motivated to learn more. I felt better about driving, but I also felt something I hadn’t felt for a long time. I felt hope. Hope that I really could take back control of my life. Hope that I could stop feeling ashamed of being different. Hope that I could go out and do more with my kids instead of always making excuses about why “Daddy’s too busy.” I REALLY hoped I’d seen the last of that hurt, disappointed look on their young faces. I discovered I actually started to ENJOY driving, even look forward to it. I was becoming a different person, a “normal” person, just like the people I’d secretly envied for so long. My hope was becoming a reality, and then I began hoping I could help others suffering from this debilitating problem. I promised myself that I would find a way to turn the techniques I had accidentally discovered at that small community center class into a step-by-step system that anyone could follow. I was stunned by how quickly I had released my driving anxiety. I wasn’t just controlling it; I’d actually gotten rid of it. I’d gone from an extremely anxious driver to a normal driver in just a few weeks. I knew I was going to need expert help taking what I’d learned and converting it into an actual program to end driving anxiety. I’m not a health care professional or an expert writer. I’m an everyday person, just like you. I also wanted to make sure the incredible results I’d experienced weren’t just a random fluke. I needed to understand the scientific principles behind what I’d learned to make sure it wasn’t just a bunch of New Age hocus pocus. I realized I needed help from an expert on treating anxiety. I searched high and low in my local community. I searched on the Internet. I was frustrated at the lack of information about driving anxiety. There were plenty of books about generalized anxiety and panic attacks, but almost nothing about fear of driving. I got discouraged, but I kept on digging. There must be SOMEBODY out there who understood the treatment of this problem. 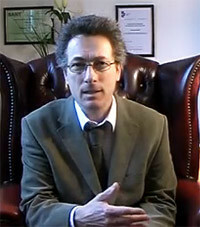 Then one day I found a video clip of London-based anxiety expert Andrew Cunningham. I was intrigued by his calm presence and straightforward approach. He said he could end driving anxiety in as little as three sessions. I was skeptical, but I contacted Andrew on Skype. The first thing that impressed me was that his treatment model is goal-oriented and not a bunch of useless talk therapy. He doesn’t waste time rehashing the past. Instead, he’s all about helping people decide how they want to reshape their lives and then helping them do it. 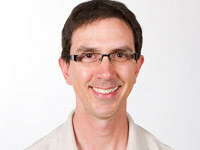 As a board-certified, clinical therapist, Andrew has helped thousands of people release their fears and anxieties. He’s worked with people from all walks of life, including British TV star Zoe Salmon. Andrew has seen many different kinds of driving anxiety in his 15 years of private practice as an anxiety treatment specialist. Because he understands that anxiety can’t be conquered just by “talking” about it, he was able to quickly explain the science of brain reprogramming using concepts that were easy to understand. I felt like all my searching had finally paid off. Andrew really “got it,” and already had a working system for achieving the same results I’d experienced. This was the guy I’d been looking for! Develop a system of powerful techniques to end driving anxiety. Understand how easily the brain can be reprogrammed to see driving as a safe and calm activity. Build an arsenal of instant tools to combat anxiety in real life driving situations such as driving on freeways or over bridges. Learn that the best way to beat anxiety about driving is teaching the brain to not become anxious. Understand and conquer the mind’s hidden agenda about fear of driving that keeps us stuck. Greatly speed up the creation of new, healthy neural pathways through the proper use of thoughts. Andrew and I have developed this easy to follow program that we call Driving Peace, because that’s exactly what it does. This powerful program quickly turns driving anxiety into feelings of peace, calm, and control. Our program works because it addresses the root cause of your fear: the neural pathways in your brain that have negatively and incorrectly associated driving with a sense of danger. These pathways trigger your body’s “fight or flight” response, resulting in anxiety, fear, even feelings of panic. Driving Peace lets you reach into your brain’s “circuit panel” and literally rewire the painful and limiting pathways that inappropriately react to driving as though it’s a threat to your physical safety. Driving Peace is not useless “feel good” therapy like affirmations, “positive thinking,” or any other New Age fluff. I would never waste your time with that nonsense. I don’t want to help you “manage” your fear or simply mask your symptoms. I want to show you how easy it is to go right to the actual source of your fear response and turn it OFF. Doesn’t that make more sense than just “coping” with driving anxiety? You’re already sick of coping with it; you want to get RID of it. The Driving Peace program is based on science’s new understanding of the brain’s fear centers. In our program, Andrew and I will show you the quick and simple way to reprogram your brain’s response to driving anxiety. Quit masking the symptoms of driving anxiety and treat the cause. Start seeing positive results right away. Easily achieve and maintain a sense of calm while driving. Eliminate harmful tension in the body. Quickly stop feelings of anxiety before they start. Have the freedom to travel and enjoy vacationing again. Reclaim lost career opportunities and become better family providers. End bickering and needless tension with partners or spouses about driving. Enjoy family outings and activities again. Gain personal freedom and autonomy. Eliminate pointless shame, guilt, and embarrassment. Build personal confidence and a sense of inner peace. End driving anxiety without dependence on dangerous or addictive medication. Start driving again, even if they haven’t driven in years. Stop dreading their morning commute. Anxiety treatment expert Andrew Cunningham estimates he’s helped over four THOUSAND people unload the heavy burdens of unwanted anxieties during his career. 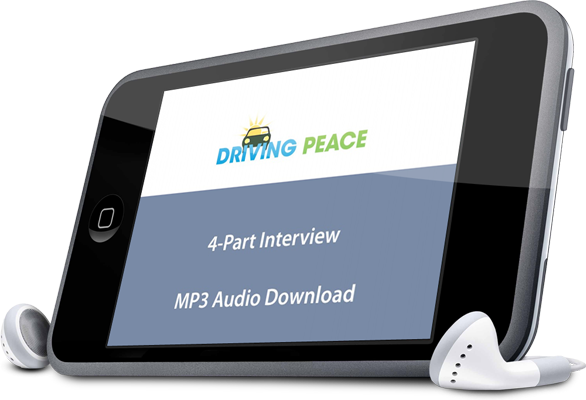 His wealth of knowledge, experience, and his calming presence form the backbone of the Driving Peace program in this exclusive one-on-one audio interview. This life transforming session is like having your own personal driving anxiety coach that you can take with you anywhere. 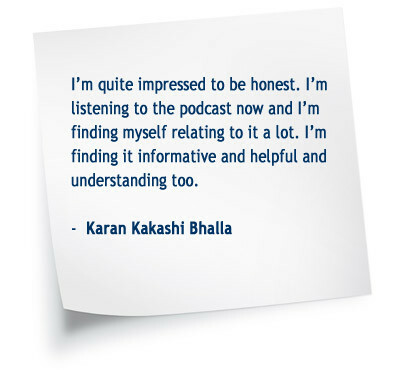 Delivered in MP3 audio format, you can download the interview and listen to it on your computer, laptop, your mobile device, car stereo, even your iPod. It’s compatible with any device that plays mp3 files and is designed to do one thing: put YOU back in the driver’s seat. In Part I, Andrew proves that the real source of your driving anxiety is NOT external events like red lights, heavy traffic, freeways, or driving over bridges. Your anxiety is the result of negative internal links between your brain and your emotions. Andrew shows you how to take control using a simple exercise that immediately begins removing these self-defeating connections. Part I gets you ready to drive with a cool head and a calm, relaxed body. In Part II, Andrew explores the hidden psychology behind driving anxiety. He shows you how to root out and expose the brain’s “crazy thinking” about driving that keeps you stuck in “fight or flight” mode. These toxic thoughts warp your ability to distinguish between real and imaginary danger. Andrew shows you how to use your internal mental power to straighten out your thoughts while you heal your emotions. Mindfulness is a “quick and dirty” technique you can use to fight anxiety while you’re actually driving. Andrew explains how anxiety controls your emotions with fearful thoughts about what “might happen.” Then he shows you how to “turn the tables” on anxiety using the brain’s built-in power of attention. Used properly, this powerful weapon can shut down anxiety like flipping off a light switch. You probably didn’t become an anxious driver overnight. It’s very likely that your fear of driving grew gradually worse over time. In this final interview segment, Andrew explains why healing from driving anxiety takes practice and that setbacks are a normal part of the process. He talks about keeping yourself motivated by tracking your progress over time so you can see how fast you’re improving. People are very self-critical and tend to focus too much on their mistakes. We all do it. It’s just human nature. However, learning to recognize your progress is crucial to your recovery from driving anxiety. But how do you know for sure that you are making progress? It’s pretty clear that our brains can trick us, right? One of the problems anxious drivers have is what I like to call “what-iffing.” “What-iffing” are the irrational thoughts about all the terrible disasters that will happen if we drive a car. Sometimes we know these things WON’T actually happen: the bridge we’re on WON’T collapse; we probably WON’T actually die of embarrassment if we get lost, etc. Yet just knowing our thinking is irrational does NOTHING to stop these intrusive, fearful thoughts from occurring. Other times we DON’T know when we’re being irrational. 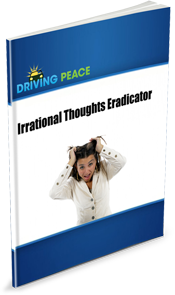 The Irrational Thoughts Eradicator is a worksheet designed to help you expose and challenge your irrational thoughts while eradicating them from your mind. Mindfulness (a.k.a. focusing though your physical senses) is your main weapon to end driving anxiety while you’re actually driving. It’s extremely simple, but it can be difficult to use when you feel overwhelmed in the car. The Mindfulness Maximizer gives you easy but specific instructions for how to turn that anxiety off like turning out a light. 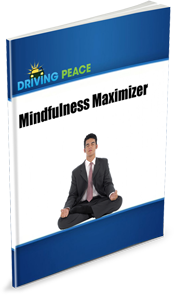 This is a very powerful tool that I could sell separately from this course, but I’ve decided to include it free with the main Driving Peace program. It shows you how to correctly use mindfulness to beat driving anxiety better than any other product out there. You can even take it in the car with you. Driving Peace Will Quickly and Effectively Help You End Driving Anxiety – Guaranteed! I personally guarantee that if you make a diligent effort to use the techniques in this program, you’ll see a huge improvement in your ability to drive free from nagging worry, panic, and obsessive thoughts within 30 days, faster than you ever thought possible. Try the Driving Peace Program for 30 days, and if you sincerely feel that I fell short in any way on delivering everything I’ve promised…if you’re not driving more easily and peacefully than you ever thought possible, let me know and I’ll give you a complete, 100% refund with no hard feelings and no questions asked. Picking their kids up from school. Making short trips to the market. Waiting calmly at red lights. Traveling and going on vacation. Aren’t you ready to stop wasting your life and happiness because of your fear? 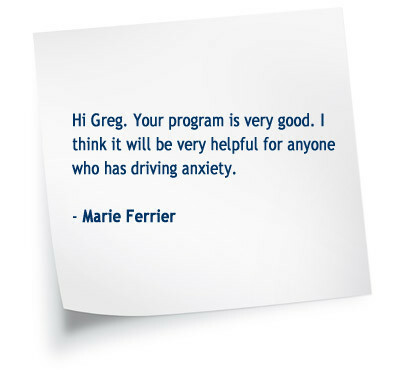 Your anxiety is highly treatable, and the Driving Peace program gives you the tools to overcome ANY aspect of driving anxiety, whatever form it may take. I think you’ll agree that it’s time to take control and put yourself back in the driver’s seat of your life. 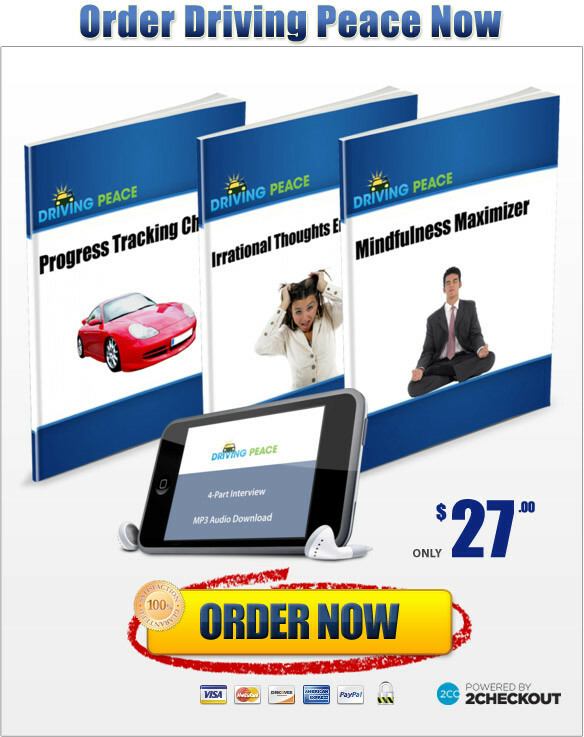 NOTE: The Driving Peace program is an instantly downloadable program. No physical products will be shipped. After you order, you will get immediate access to download the program to your computer. The format is mp3 and Adobe Acrobat PDF, both compatible with Mac or PC. Now you have to make a simple choice. You have two options, and only you can decide which one is best. You can continue on as before, driving with sweaty palms, a racing heart, and a knot in your stomach. You can keep avoiding driving altogether. You can keep making excuses, hiding, and feeling isolated. You can stay stuck at home and keep putting off vacations and all the other things you wish you could do. You can keep getting what you’ve always gotten if that’s what you want. You don’t have to change. You can come with me now. 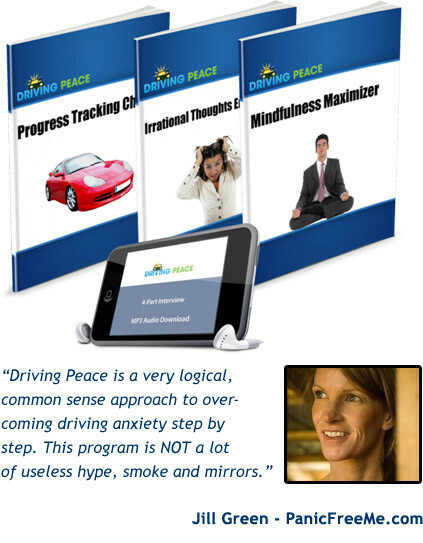 You can purchase the Driving Peace program and get back your confidence and peace of mind. You can get back your control over your own feelings and reactions. You can choose a different life, a NEW life, and you don’t need any magic tricks to do it. And Andrew and I will be with you every step of the way. P.S. – Are you ready to make this change? Are you ready to lead the life you’ve always wanted, free from fear? It’s your life. Are you going to keep wasting it by living needlessly with driving anxiety? 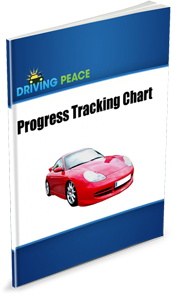 The Driving Peace program is completely, 100% guaranteed, so what are you waiting for? It’s time to get your life back.